Fashionistas Daily .Com: Salvatore Ferragamo - Manhattan Briefcase - A perfect bag for stylish men! Salvatore Ferragamo - Manhattan Briefcase - A perfect bag for stylish men! 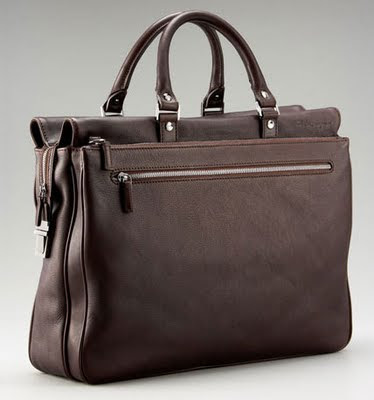 This bag is a perfect work bag for any men who is always on the run and need something that's classy yet still has that designer touch to it. Choose hickory or nero (black) calfskin. Silvertone hardware. Top handles with square rings. Zip top. Front zip pocket. "Manhattan 1" is imported. Click on the photo below to see more details. It's a perfect stylish gift for your husband, boyfriend or treat yourself with this stylish bag!